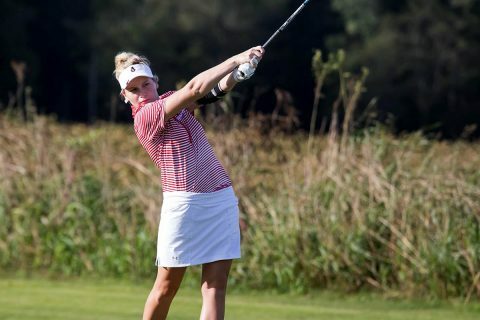 Glencoe, AL – Freshman Taylor Dedmen made a little history and junior Meghann Stamps held onto her top-10 standing for Austin Peay State University (APSU) women’s golf at the Chris Banister Classic at Silver Lakes Golf Course. The Govs remained in third with a three-round 945 (313-312-320), eight shots clear of Tennessee Tech. Host Jacksonville State won the event with a 904, followed closely by Murray State (907) in a field heavy on Ohio Valley Conference squads. Dedmen’s final-round 78 was the best by a Governor and moved her into a tie for 12th at 237 (82-77-78); she’s now the first Gov since Staci Lynch (2006-07) with three consecutive top-20 finishes as a freshman. She was particularly adept on the front nine during the final round, carding a 37 out and knocking down a par on the par-4 No. 8 that on average played more than a stroke over par on the day. Stamps’ run of brilliant play continued with an eighth-place finish, the third top-10 finish in her last four outings dating back to last April. While her final-round 82 contrasted her red-hot opening round of 73, her overall 230 (73-75-82) kept her comfortably in the top-10 and was aided by team-highs in birdies (six), pars (31), par-5 scoring (5.08/hole) and par-4 scoring (4.30/hole). Seniors Reagan Greene (79-77-84—240) and Taylor Goodley (79-84-79—242) both posted solid top-20 finishes, tying for 15th and 19th respectively. Greene closed strong, going one-over on the final five holes and parring No. 18—a par-4, 353-yard beast that had played as the course’s toughest in the first two rounds. Freshman Shelby Darnell rounded out the lineup at 246 (82-83-81), placing 23rd. However, her 2.92 average on par-3 attempts led the tournament, one week after leading the Greenbrier Invitational in par-5 scoring. Playing as the individual, sophomore Andrea Presilla wrapped up her season’s debut at 272 (87-93-92), placing 34th. The Govs host their big fall event next week, with the F&M Bank APSU Intercollegiate set for October 1st-2nd at Clarksville Country Club.